COLUMBUS, Ohio — Farmers who want to tap into the state’s surging craft brew industry now have a guidebook to help them grow a key ingredient: barley for malting. Since raising barley for beer is considerably different from growing it to feed animals, grain experts from the College of Food, Agricultural, and Environmental Sciences (CFAES) at The Ohio State University have just published a guide on growing it for malting. In Ohio, winter barley is planted in early fall and harvested in late June, typically avoiding high temperatures that can increase protein content in the grain. 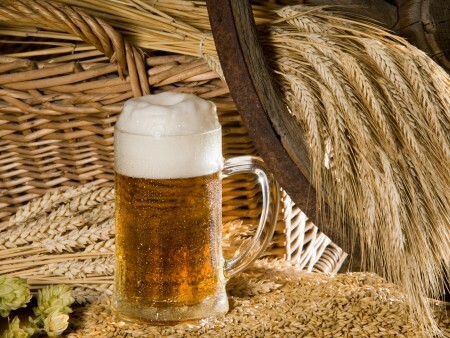 Barley for beer needs to be low in protein and high in carbohydrates. Barley for feed animals, which is what most of the barley grown in Ohio is used for, is the opposite: high in protein and low in carbohydrates. The number of acres planted in malting barley in Ohio is on the rise, spurred by the state’s growing craft brew industry, Stockinger said. He is testing seed varieties in plots across Ohio to find one that will produce barley suitable for malting and good enough for beer. A new privately-owned malting facility is expected to be built in Marysville, creating a demand for local barley. Malting involves soaking dry barley, letting it germinate and then drying it for use in making craft beer. As it stands now, much of the craft beer made in Ohio uses barley from outside the state, including Europe. Farmers who plant barley for malting need to guard against head scab, caused by a fungus that can reduce the quality of the barley grain, said Laura Lindsey, a small grains specialist with Ohio State University Extension. Lindsey has test plots of winter barley around the state and both she and Stockinger are among the authors of the new guide on growing the crop. Applying the right amount of nitrogen at the right stage is critical because too much nitrogen or nitrogen applied too late could increase the protein content in the barley, making it unsuitable for beer, Lindsey said. Barley for malting is expected to bring in $6 to $7 a bushel, Stockinger said. While that price may be attractive, if anything goes amiss in harvesting or storing the barley, the malting facility could reject the crop, and currently there are no secondary markets for it. Barley for malting can’t be stored in a common silo because if the barley mixes with other barley varieties, it can be rejected, Stockinger said. A maltster may also reject barley if the seed coat of the grain is damaged during harvest.